The term attorney-client privilege is in the news today. If you have an attorney, or if you are about to hire an attorney, or if you are thinking about an attorney, some of this news may be alarming to read. So before you go any further, I want to give you three important things to know about attorney-client privilege. Attorney-client privilege protects confidential information learned by an attorney in the course of consulting with, advising, or representing a person. Attorney’s can’t give good legal advice if they don’t have good information. Sometimes the information the attorney needs is something the client doesn’t want other people to know about – like how much money they have, or whether they gave a child up for adoption, or that their mother would make a terrible guardian for their child. The attorney client privilege is intended to make sure that people feel comfortable telling their attorney all relevant information so that the attorney can give the right legal advice to them. Attorney-client privilege does NOT protect communications made in order to plan, continue, or cover-up a crime. If a client confesses a crime to an attorney, that information is covered by attorney-client privilege. But if the client and attorney discuss how to commit a crime, or if the attorney gives advice on covering up a crime that has already been committed, those communications are not covered by privilege. An attorney cannot help a person commit a crime, and any communications surrounding such advice or assistance are not protected by privilege. 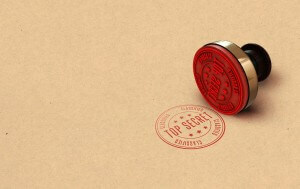 Attorney-client privilege does NOT apply if the communications aren’t made in a confidential manner. The attorney-client privilege extends only to communications and information that is intended to be confidential. If the client discusses information in front of people who are not connected to the representation, it may not be considered confidential. Talking to or in front of the attorney’s staff is generally the same as talking to the attorney, but if a person discusses information in a public area where others can overhear, that may void the confidentiality. Clients sometimes want family members to sit in on meetings with their attorney, but doing so might mean that anything discussed in front of the family member loses its attorney-client privilege. What does this mean for you today? It means that despite what you may hear in the news, attorney-client privilege is alive and well and will protect your confidential communications with your attorney. This also means that it is safe to answer any questions your attorney needs to ask in order to properly represent you. If you are hesitant to tell your attorney a sensitive piece of information, ask about confidentiality first and have your attorney explain to you how the privilege works in your specific situation.